Clear aligner technology has been improving over the years and can correct many malocclusions that once would have been too complicated for this form of treatment. Yet there are still some situations for which traditional braces would still be best. This can be discussed in detail with you by our Naperville dentist. Here's how it works: Specialized computer software is used to design a plan for moving your teeth from their current positions into the best possible alignment. This movement will be broken down into perhaps several dozen stages. For each stage, the Invisalign company will manufacture two plastic mouth “trays” or “aligners,” one to fit over your top teeth and one for the bottom. You will wear this first set of trays for two weeks, for a minimum of 20 hours per day. You will then move on to the next set of aligners in your series to accomplish the next stage of gradual movement. Our Naperville dentist will monitor the progress until your teeth are correctly aligned. In the past several years, two features have been added to make Invisalign a more appropriate orthodontic treatment method for teenagers. Special “eruption tabs” hold the appropriate amount of space open for molars that have not fully grown in. 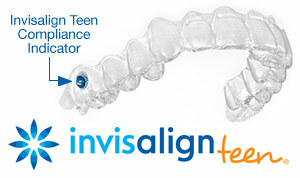 Invisalign for teens also comes with “compliance indicators” built into the aligner material, which fade with wear. This allows our Naperville dentist, and the patients themselves, to make sure the trays are being worn as prescribed. Treatment with Invisalign can only be successful if this is the case. Also, please keep in mind that while wearing clear aligners is very different from wearing braces, the importance of retaining your post-treatment results is exactly the same. You'll want to be sure to wear your retainer(s) exactly as prescribed by our Naperville dentist, after your treatment is completed to protect your investment in a beautiful new smile. Want straighter teeth with Invisalign? Make an appointment at North Creek Dental Care of Naperville in Naperville, IL at (630) 983-9877!